An estimated 4 million chemical compounds exist in the environment. About 63,000 are commonly used in America, and another 1,000 or so are being synthesized every day. Some are healthy, some are harmless, and some are highly toxic. Chronic chemical sensitivity has become widespread. Roughly 4-5 million Americans already suffer from the effects of chemically induced environmental illnesses. Numerous health threats include risk of cancer, respiratory illnesses and eye, skin and throat irritations. These illnesses lead to absenteeism, reduced productivity, increased insurance rates and sometimes liability and litigation. Studies show that the air in our home and work place is now commonly more polluted than outside air – up to 10 times as dirty – with some pollutants reaching concentrations that would be illegal in the atmosphere. Contaminants quietly emanate fumes (“off-gassing”) into room air. 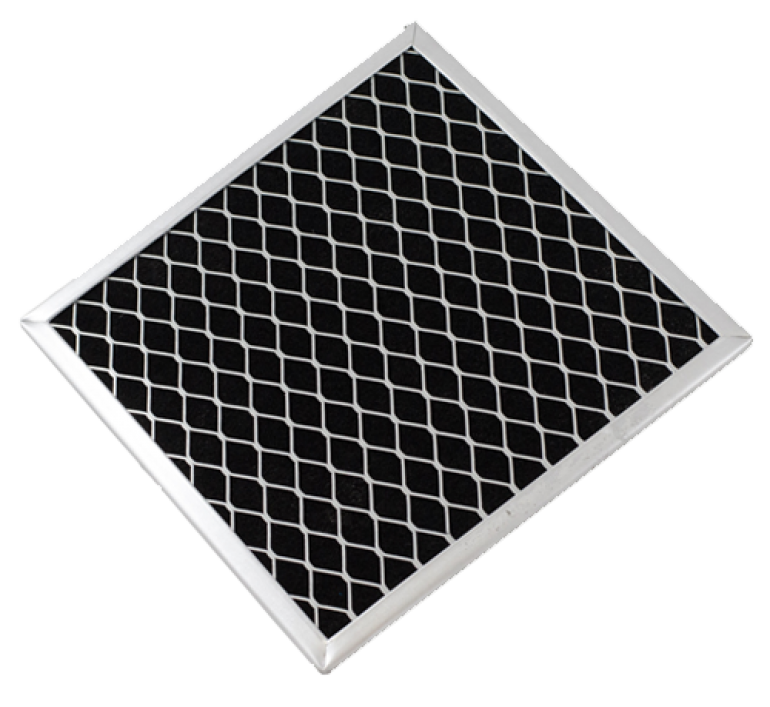 Activated carbon air filters, also known as charcoal impregnated air filters, are widely recognized as an effective method of removing and preventing odor/fume buildup in recirculated air. Utilizing the finest quality coatings, Permatron offers a line of high efficiency odor, fume and gas removing activated carbon commercial air filters that include bulk air filter media and pads cut to size, pleats, panels, high density granular carbon packs, bulk carbon and V-bank replacement trays. 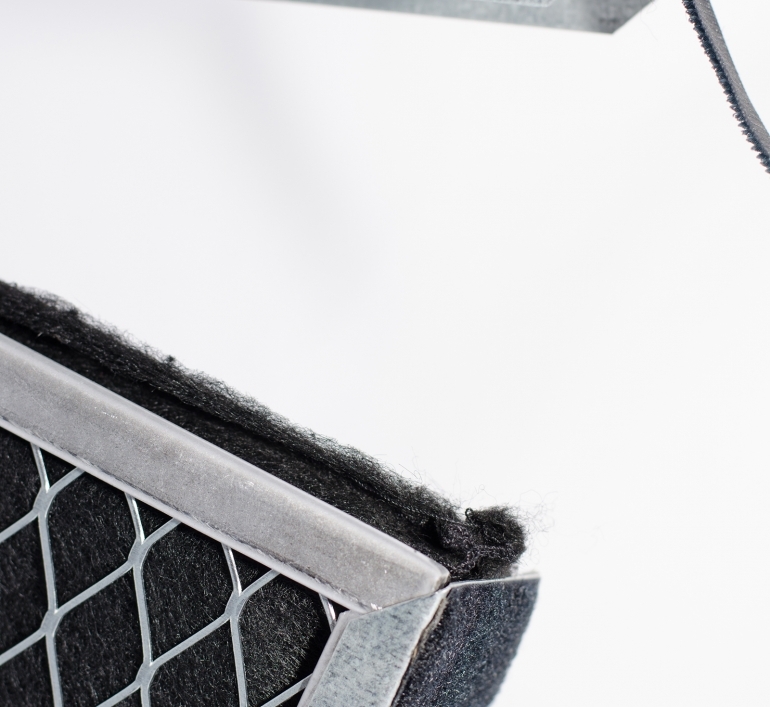 Charcoal impregnated air filters are highly effective for organic based odors. Activated carbon, mixed with alumina and potassium permanganate is highly effective for organic odors and light gases like ammonia, formaldehyde, hydrogen sulfide and sulfur dioxide. 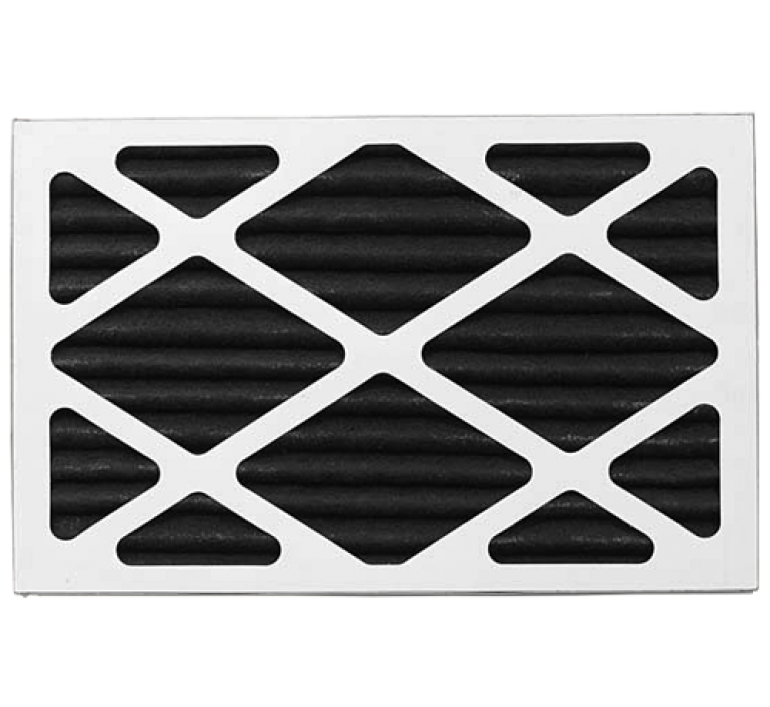 1″ pleated type activated type air filters have approximately 3X the effective media surface of 1/4″ panel type activated air filters. High density granular carbon packs and V-bank trays contain even more effective media. Activated Carbon Air Filters – How Do They Work? Synthetic media substrates, like nonwoven polyester, are impregnated with finely ground coatings, such as activated carbon, zeolite or alumina, and heat set to retain those coatings even when the activated carbon filter media is rinsed or vacuumed. 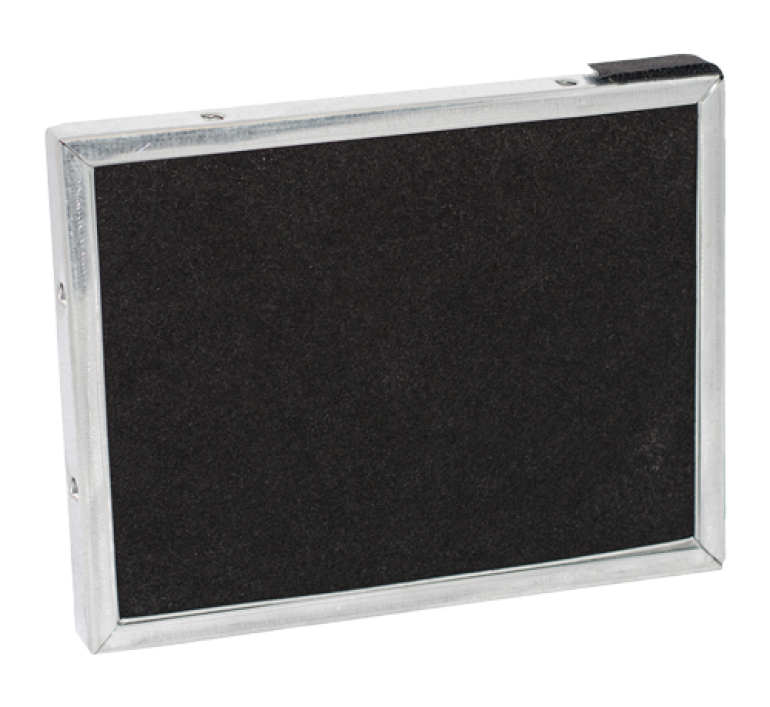 Just as a sponge soaks up water, an activated carbon commercial air filter absorbs odors and fumes into its media. The odor causing molecules are actually removed from the air permanently, not masked with another odor. Air velocity, humidity and temperature can influence the odor elimination. At times of high odor generation, air should recirculate through the activated carbon filters to achieve maximum effectiveness. The rate of adsorption depends on the relationship between the pore structure, or surface area, and the shape of the contaminating molecules. Activated carbon filters are disposable air filters. Once they are saturated with odors, fumes or gases, approximately every 3-6 months, they must be replaced. Particulate plus odor, fume, gas removal is also available in our DustPlus® model. 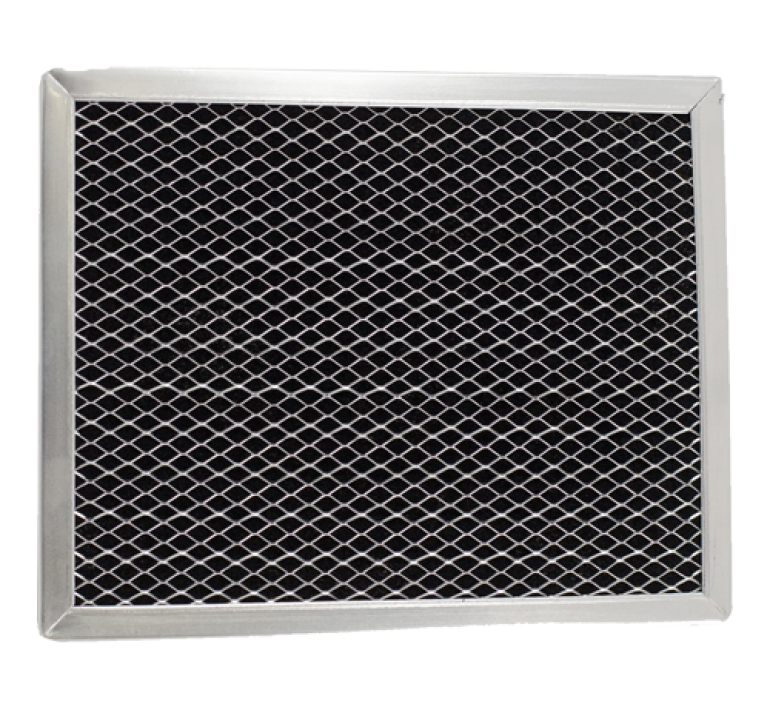 This unit has a permanent, washable polypropylene front panel and an interchangeable activated carbon back panel enclosed within a 1″ or 2″ steel frame with wire reinforcement. The type of interchangeable back panel and amount of activated carbon required will depend on the amount of odors, fumes or gas to be removed. Activated carbon is an effective method of removing and preventing odor/fume buildup in recirculated air.